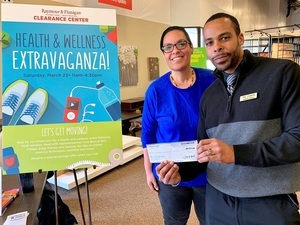 Representatives from Boys & Girls Village attended the Raymour & Flanigan Health & Wellness Extravaganza on Saturday, March 23rd to spread awareness about the organization, and its commitment to improving health and wellness. Jolynne Gonzalez and Lindsay Oddo spoke with customers about the work the organization does. Behavioral health services are the cornerstone of the Milford-based organization’s mission, but Boys & Girls Village also provides permanency planning, such as therapeutic foster care, special education instruction, vocational programs and juvenile justice programming. Johnson presented the organization with a donation from Raymour & Flanigan.